28. And when He was come into the house, the blind men came to Him, and Jesus saith unto them, "Believe ye that I am able to do this?" They said unto Him, "Yea, Lord." 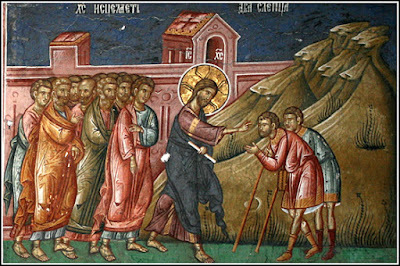 He led the blind men along even as far as the house, to show their steadfast faith and thus to condemn the Jews. He asks them if they believe, showing that faith can accomplish all things. 29-30. Then touched He their eyes, saying, "According to your faith be it unto you." And their eyes were opened. He healed within the house and in private, to show us how to avoid vainglory. In everything He did He taught humility. 30-31. And Jesus sternly charged them, saying, "See that no man know it." But they, when they were departed, spread abroad His fame in all that country. Do you see Christ's humility? They spread abroad His fame in thanksgiving, not out of disobedience. But if in another place Christ says, "Go and tell of the glory of God" [Lk.8:39], there is nothing contradictory in this. For He wants them to say nothing about Himself, but to speak of the glory of God. 32-33. As they went out, behold, they brought to Him a mute man possessed with a demon. And when the demon was cast out, the mute spake. The disease was not a natural one, but from the demon. This is why others brought him forward. He himself was not able to call upon Jesus, as the demon had bound his tongue. Therefore Jesus does not require faith of him, but immediately heals him by casting out the demon which had prevented his speech. And the multitudes marvelled, saying, "It was never so seen in Israel." The multitude marvelled, placing Christ even above the prophets and the patriarchs. For He healed with authority, unlike those who first had to pray. But let us see what the Pharisees said. 34. But the Pharisees said, "He casteth out demons through the prince of demons." These words are the height of stupidity, for no demon casts out other demons. But let us suppose that He cast out demons as one who served the prince of demons, that is, as a magician. How then did He heal diseases, forgive sins, and preach the Kingdom? For the demon does just the opposite: he brings on diseases and separates man from God. 35. And Jesus went about all the cities and villages, teaching in their synagogues, and preaching the Gospel of the kingdom, and healing every disease and every infirmity among the people. As Lover of mankind He did not wait for them to come to Him, but He Himself went all around. Therefore they could not say as an excuse that "no one taught us." He draws them to Himself by word and deed, teaching and working wonders.